Burt Williams’ Morning Dew Ranch Changes Hands Iconic California winemaker, Burt Williams, has put his 40-acre property in Anderson Valley up for sale for $1,920,000. The property includes a 12-acre vineyard currently sourced by Drew Family Wines, Williams Selyem and Brogan Cellars, a 2-bedroom house, and a small winery with a lab and crush pad. Burt last released his own wine from this property from the 2009 vintage. I have heard that the property is currently in escrow and being sold to V. Sattui Winery that owns another Anderson Valley vineyard and bottles Pinot Noir from Anderson Valley, North Coast, Los Carneros and Santa Lucia Highlands. Followup January 5, 2016: Morning Dew Ranch was sold to Dario Sattui for Castello di Amorosa. Jadot to Release Resonance Vineyard Pinot Noir in 2016 Noted Burgundy wine company, Louis Jadot, bought Resonance Vineyard from Kevin Chambers in 2014. 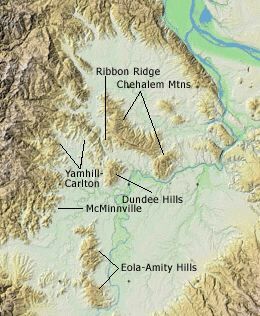 The noted vineyard is located in the Yamhill-Carlton District and sits adjacent Gran Moraine Vineyard and has Pinot Noir vines planted on their original roots between 1981 and 2006. Jadot’s 2013 bottling has been in barrel at Trisaetum Winery in Ribbon Ridge and is scheduled for release March 2016. Jacques Lardière is the winemaker. The price and name of the new wine has not been disclosed. Smith Story Wine Cellars Hires Ross Cobb and Katy Wilson as Winemakers Spouses Eric Story and Alison Smith-Story, who met while working for K&L Wine Merchants in Northern California, bring over a combined 30 years of wine industry experience to Smith Story Wine Cellars. Ross Cobb makes Pinot Noir under his own label, COBB Wines, and crafts wines for Hirsch Vineyard. Katy Wilson produces Sonoma Coast Pinot Noir under her LaRue label. Together the “Dream Team” consult for Anaba Wines and now Smith Story Wine Cellars. Smith Story offers both white (Sauvignon Blanc, Semillon and Chardonnay), and Red (Pinot Noir from Helluva Vineyard in Anderson Valley), as well as a Riesling and Rosé from Rheingau, Germany. The inaugural vintage is 2014. A Kickstarter Crowdfunding campaign raised funds for the winery’s grape growers.The website is www.smithstorywinecellars.com. Discussions Underway for New Willamette Valley sub-AVA The Chehalem Mountains AVA extends 20 miles in length and 5 miles in breadth and is an uplifted land mass southwest of Portland. It includes several discrete spurs, mountains, and ridges, including Ribbon Ridge and Parrot Mountain. Soils on the southern and western slopes are primarily Jory (basaltic) and ocean sedimentary (Willakenzie), while soils on the northern face of the mountains are wind-blown loess (Laurelwood). A group of wineries on the northern face have entered discussions to create a sub-AVA of the Chehalem Mountains (Ribbon Ridge already is a sub-AVA of the Chehalem Mountains) that would be based on vineyards having Laurelwood soil. 2016 Oregon Chardonnay Celebration The fifth annual Oregon Chardonnay Celebration will take place Saturday, February 27, 2016, at The Allison Inn & Spa in Newberg, Oregon. This event was founded as the Oregon Chardonnay Symposium and has now joined forces with the International Pinot Noir Celebration. The Oregon Chardonnay Celebration begins with a seated seminar and tasting, followed by a walk around Grand Tasting of over 40 Oregon producers, one of the region’s largest varietal-specific tastings. The Seminar will present four winemakers who will discuss their interpretation of Durant Vineyard’s 2014 Chardonnay, all made from the same single block of clone 96 fruit. For more information and tickets, visit www.ipnc.org. 2016 30th Annual International Pinot Noir Celebration An Early Bird Special is being offered until December 31, 2015, for the 30th celebration. Full Weekend guests can save $100 per ticket due to early bird pricing. Hotels and on-campus accommodations fill up quickly, so you should look into lodging options now. The ipnc website, www.ipnc.org, has a full list of local accommodations including on-site room or apartment. Passport to Pinot tickets on July 31, 2016, are now on sale for $125. This outdoor tasting offers Pinot Noir from over 70 wineries and culinary treats from 15 of the Northwest’s top chefs. 11th Annual Celebration of Pigs & Pinot Chef Charlie Palmer has announced that the 2016 Pigs & Pinot event will be held March 18-19, 2016, at Hotel Healdsburg. Tickets go on sale January 20-21, 2016. Guest chefs include Matt Lambert, Barbara Lynch, Michael Mina and Bryan Voltaggio. Guest wineries include Williams Selyem represented by winemaker Jeff Mangahas, Paul Hobbs represented by owner and winemaker Paul Hobbs, Handley Cellars represented by co-winemaker Randy Schock, and Mt. Difficulty represented by winemaker Matt Dicey. For more information, visit www.pigsandpinot.com. In Pursuit of Balance 2016 Event Schedule Announced IOPB will hold trade tastings February 4-6, 2016, at TWE and February 22 in London, on March 13-16 for attendees of ProWein, and April 17 (public tasting) and 18 (trade tasting). Tickets for the Los Angeles public tasting will go on sale in the spring of 2016. Visit www.inpursuitofbalance.com. American Wine Consumers Still Prefer Chardonnay and Merlot Sonoma State University and the Wine Business Institute reported their 2nd annual survey of American wine consumer preferences. The survey of American wine consumers ranging in age from 21 to 68 found that despite the popularity of red blends and Pinot Noir, the American consumer still loves Chardonnay and Merlot. When asked to pick their favorite grapes from a list, 50 percent included Chardonnay and 49 percent Merlot in their selections. 38 percent chose Cabernet Sauvignon and Pinot Noir. Respondents also preferred wines that are “fruity,” “semi-sweet,” and “smooth.” Only 26 percent said they preferred dry styles of wine. Meiomi Pinot Noir is a perfect example of the American palate preference for intensity fruity wine that is smooth or plush. 72 percent said that cost was the most important factor in choosing a wine. Those in the survey who considered themselves wine connoisseurs tended to be willing to spend more and showed a preference for dry wines. Asked why they drink wine, the majority of the respondents said they liked the taste, wine goes well with food, and wine offers relaxation and socialization opportunities. Beaux Frères Touts the 2014 Vintage and offers a Special Release Winemaker Mike Etzel has called the 2014 vintage in Oregon “epic.” So epic, that the winery will create a separate bottling from the Beaux Frères Vineyard for the first time ever - Cuvée ’59.’ While working on the blends for the 2014 wines, Mike was taking a break and reading through some tasting notes from Burgundy vintages of the past. An entry for the 1959 vintage read like an excerpt from the 2014 Oregon growing season summary. The similarity spurred Mike to select barrels from the oldest blocks of own-rooted Pommard and Wädenswil plantings in the original Beaux Frères Vineyard to create 475 cases of this special wine ($125). Visit www.beauxfreres.com to order. Adelsheim Releases $225 Vintage 35 Pinot Noir For the fourth time in Adelsheim’s history, Vintage 35 from the 2012 vintage has been released. Named in celebration of the winery’s 35th vintage year, this 2012 Pinot Noir is made entirely from estate grown fruit sourced frtom Bryan Creek and Calkins Lane vineyards in the Chehalem Mountains. It is a blend of wines from winemaker Dave Paige’s favorite five barrels and was held in bottle for two years before release. A few Oregon Pinot Noirs have exceeded $200 in price in recent vintages and although surprising at first glance, is not out of place considering the quality of Pinot Noir wine in vintages like 2012. Comparing $225 to the prices Burgundy now commands for Premier Cru and Grand Cru red wines, the Adelsheim bottling seems relatively reasonable. What’s your preference in Pinot: single, double or triple figures? Remember PINO sands for “Price is No Object.” Adelsheim’s 2012 Nicholas Estate Pinot Noir, Winderlea Pinot Noir and Zenith Pinot Noir are priced at $225 in magnum format. Visit www.adelsheim.com to purchase. Annual PinotFile Pinot Noir All-Americans Look for the next issue arriving at the end of the year that features the 2015 Pinot Noir and Chardonnay All-Americans.